The weather gods were on our side and rain, whilst desperately needed, stayed away long enough for us to complete the course, although the temperature had started to drop ahead of the cold front.The course started in the Kingfisher Centre dealing with the theory which would be put into practice later in the day. This session also gives the class a chance to get acquainted and to feel free to pose questions and challenge statements more easily. This lively group settled down very well and was soon asking challenging questions. Then outdoors for a session on the basics of gardening and to be shown what Hillcrest Conservancy achieves with funds raised from this course. The work done by William and his brother Vincent (previously unemployed Embo residents) on removing alien invader plants from the verges of Springside and other roads, as well as the railway line reserve, is truly amazing and brings home to the students exactly what can be achieved. Returning to the Kingfisher Centre to meet Pat McKrill, local Herpetologist, and his camouflaged boxes of tricks, students sat in a relaxed atmosphere waiting for the next segment, some very close to the afore mentioned boxes. Once Pat and his snakes were introduced, the atmosphere changed at lightning speed, some in close proximity to the boxes, departed in what can only be described as less than dignified manner, others merely became very silent and subdued. Other reactions as the snakes made their appearance can only be described as comical and it required great self-restraint not to burst into laughter at those in apparent distress. The earlier cold weather had made the snakes slow to respond to the attention focused on them but the sun very soon warmed them and they became active participants in what became the highlight of the course for many. It was not long before Pat had the entire group touching a snake and soon they were nonchalantly holding them like they would a newborn puppy. 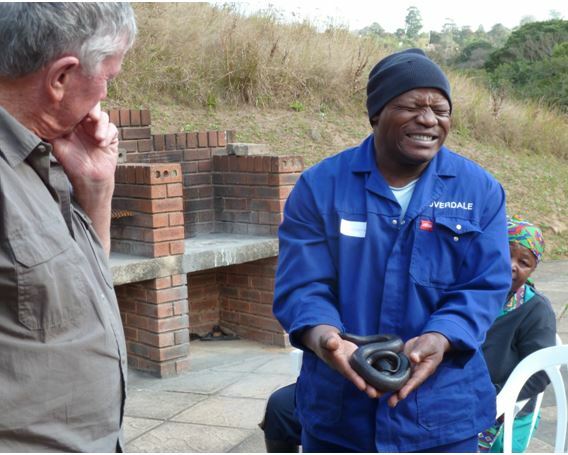 All fears dispelled, Pat then explained why snakes should not be killed but preserved in and around our gardens and homes. A special thanks to Pat McKrill <herpet@eastcoast.co.za> for his time which he gives freely in an effort to conserve our reptile friends. No doubt the many photos taken with cell phones will be proudly shown at every opportunity. A well-deserved tea break included much back slapping and congratulations on brave actions. Thanks to Carolyn for the welcome cuppa and cinnamon buns. Back to the classroom for a short theory session then out into the Reserve for practical hands-on alien invader plant eradication. The students saw the results of previous groups’ efforts and the effectiveness of correctly applied control methods. The group also soon realised that the alien invasive plants were mostly coming into the Reserve from adjoining properties where they were being unwittingly harboured. Returning to the Kingfisher Centre, for a segment presented by George Victor on safety in the work place and how to look after tools and equipment. George also emphasised the need for people to become involved in voluntary work within their communities and this benefited all within that community. Finally, well-earned certificates were handed out and farewells said to new friends. Special thanks to all who participated, George Victor, Pat McKrill, Carolyn Victor, Pat and Beryl (the team) as well as the wonderful students who always make my day a happy one. 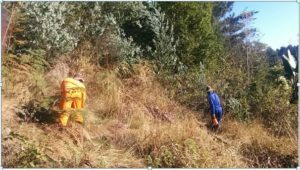 William and Vincent are employed by Hillcrest Conservancy to tackle the eradication of invasive plants surrounding Springside Nature Reserve with funds raised from the Training Course. Snake handling by the brave and the not so brave with Pat McKrill, Herpetologist, on standby.